Listen to this track by Americana architects The Band, featuring “rhythm pianist”, vocalist, and sometime songwriter Richard Manuel singing lead. It’s “Whispering Pines”, his song that he co-wrote with guitarist Robbie Robertson as featured on the Band’s 1969 self-titled album The Band, sometimes called The Brown Album. I recently finished reading Million Dollar Bash, by Sid Griffin, the story of how the band became the Band out of the ashes of the R&B backing band for Ronnie Hawkins and then Bob Dylan that they once were. It was during a 1967-68 recording stint , when four, and later all five, members of the Hawks rented a house and rehearsal space they named Big Pink in rural upstate New York. It was here that they delved into the folk music of decades and centuries past, with Bob Dylan on hand to serve as a catalyst, while also rehearsing new songs by Dylan, fresh off of Bob’s typewriter in the very house and in the very hour that they were being recorded. They in turn kept Bob on the straight and narrow in how to play in a band, after years of his playing solo. Soon, the set-up at Big Pink (and at Dylan’s house, and later Rick Danko’s house) came to represent an alternate way of making music that eschewed the constraints of the studio. This is a practice which is now commonplace, even if Dylan and the Hawks were pioneering spirits in its development. From The Cowboy Junkies recording their Trinity Sessions album at Holy Trinity Church in Toronto, to Bruce Springsteen releasing his 1982 Nebraska album based on homemade demo tapes, to Bon Iver recording a debut album in a hunting shed, the approach can be laid at the feet of the group which would eventually emerge two years later as The Band. 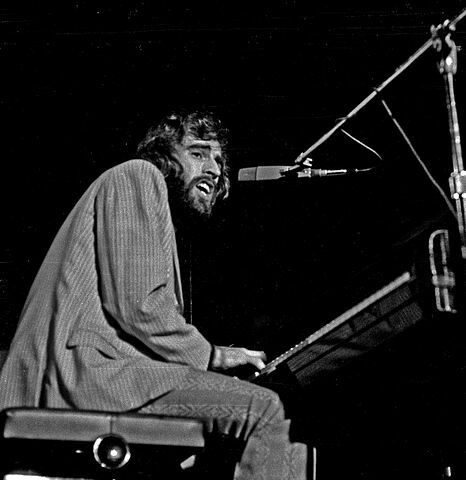 Richard Manuel of the Band; pianist, sometime drummer, and considered to be the group’s lead singer even by Levon Helm and Rick Danko, both of whom took lead vocals on many of the Band’s most celebrated material. And this approach was how this song, and the others that accompanied it, were ushered into the world, this time in a rented guesthouse as owned by Sammy Davis, Jr. of all people. The clubhouse approach brought out possibilities for this group that, arguably, might not have been accessible while under normal studio-bound conditions. For instance, the melody lines in “Whispering Pines” suggest a choral piece more so than a rock n’ roll ballad, helped along by Manuel’s gospel-tinged lead, and organist Garth Hudson’s churchy sonic colour palette. This is clearly a mix that would have taken time and the right environment to render properly. And Manuel, a troubled soul with what bandmate Robbie Robertson described as having a ‘hurt in his voice’, is in a league of his own at being able to achieve the subtleties. Manuel as a vocalist was compared to Ray Charles even by his own bandmates, and later by many others. Indeed, Manuel was a huge Ray Charles fan, and his ability to hit a similar soulful chord in everything he sang was an element that got him hired into the Hawks to begin with. And Manuel’s ability to bring this into what the Band was creating, that is, a musical stew that was far removed from the trends of the times, was considered to be his untouchable strength. Manuel had a number of personal problems which sprung from his prodigious intake of alcohol and drugs. While the Band was a growing concern from the late 60s to the mid-70s, it was this which stunted his ambitions as a songwriter, and even later as a vocalist. The hints of spiritual turbulence to be found here in “Whispering Pines” is something of a window into Manuel’s soul. Like many , perhaps if he’d been born at a later time, when these kinds of problems were more recognized as such, he might have overcome. But, sadly even after the Band reformed without Robertson in 1983 and when Manuel seemed to be making progress away from his own destruction, the darkness which seemed to plague him overtook him in March of 1986. Richard Manuel hung himself in his Florida hotel room while on tour with his old bandmates. Read more about Richard Manuel on the official The Band website. i loved seeing him and the others in Festival Express. moments like that corroborate the humanity of the songs. swell article. I associate the Festival Express film mostly with a very pissed Rick Danko, with an equally pissed Janis Joplin hanging off of him, singing some folk song of some kind; the picture of early 70s excess. More recently, I watched Manuel singing ‘Tears of Rage’ at Woodstock, which is an incredible performance. He makes it look effortless, even if his voice is the sound of sorrow itself. Thanks for this. The Band was the first band I sort of discovered on my own (rather than having a sister or friend tell me I “needed to like this to be cool”), when I was 13. They were my first concert (Trenton NJ, 1970?) and my first big love. This song is unparalleled. Thank you for comments, and welcome. I discovered the Band in England while I was in my 20s, where they seem to have, far and away, more respect than they do here in the country which bred 4/5ths of them. It was the clip of the Band on The Ed Sullivan show doing “Up on Cripple Creek”. This was a song was on the radio when I was a kid. But, I didn’t really know who they were. And I didn’t ever pick up on how musically diverse they were, and what a compact, self-contained unit they were. They remain to be more than just one of my favourite bands. They are a phenomenon, and never to be repeated, despite a few attempts. Another great moment of Manuel’s (and my favourite) is his duet with Van Morrison on Cahoots, 4% Pantomime.